The Guadalquivir River has become the symbol of the breaking down borders. Many citizens’ collectives, organized by the TNT Atalaya Center, have gathered in Seville to give life to seven days of shows and community events entitled “Río sin fronteras“. The Macro Event of social theater, one of the largest ever held in Spain, is part of the international project Caravan Next, funded by the Creative Europe Program of the European Union. More than 50 citizens’ collectives with 600 participants and 2,500 spectators showed up. Among the groups of citizens who took part in the initiative, the gipsies of Vacie, the actors of the Centro de Artes Escénicas de la Rinconada, the Association of socio-cultural promotion «Solidaridad NIJA La Bachillera», the Movement for the Development of Africa, the Escuela Superior de Arte Dramático, TNT actors and some associations working with migrants. The city of Seville was the protagonist of this week of events, who started the “Day of respect for cultural diversity“, when groups from Ecuador, Paraguay, Uruguay, Bolivia and Peru were involved in a musical and dance huge performance. An alternative, different celebration of the day of the discovery of America. “The participation of the people was exciting, we didn’t experct that. We realized that theatre is really a powerful driving force.” said Ricardo Iniesta, director of TNT Atalaya. “As TNT Atalaya we had already participated in an international project, Caravan Artists on the Road, which consisted of many itinerant performances in different spots of Europe; the actors were travelling on a van, the “Caravan”. We have gone through great part of Europe and it has been incredible. Now we needed a Macro Event like this to finally underline that we must stop building borders. This was our goal and here comes the title of the week of theatrical events”. Theater with disadvantaged groups, migrants, homeless women, gipsies of the Vacie, women suffering from cancer who talk about their illness with humor and irony, sports club, actors and children groups: these are just some of the collectives that took part in Rivers without borders. The first day of the Macro Event, the Rowing Club impressed the audience performing on the river an exciting simulation of a shipwreck in the Mediterranean sea and the consequent rescue action. The second day wad dedicated to the March for refugees across the city. 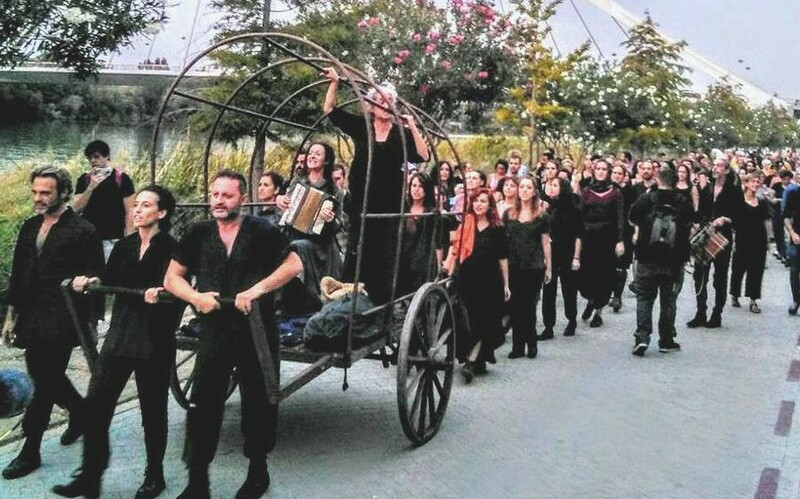 At the head of the procession, the chariot of Mother Courage [Brecht] of TNT Atalaya. Suddently everyone was lying on the ground to remember the migrants who died in the Mediterranean and the thousands that Spain rejects every year. One of the main show the audience had the opportunity to attend was «Fuenteovejuna», brought on stage by a group of gypsy illitterate women who live in the Sevillian gipsy camp El Vacie, headed by the actress Pepa Gamboa. The show has now become a classic. The public responded in an unexpected way. At the great closing of the Macro Event, a chorus of more than 100 voices sang The People’s Song of Les Miserables: audience, Atalaya professional actors, project partners such as Denmark’s Odin Theatret, Brama Theater of Poland and SCT Center, all gathered to participate in this last performance.